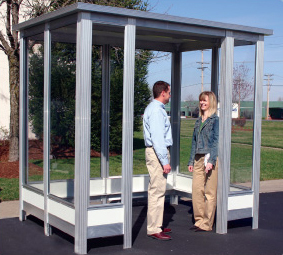 PortaFab shelters combine the strength of a heavy-duty welded aluminum framework for long-lasting durability and an aesthetically pleasing design. The welded aluminum framing provides exceptional structural strength for years of trouble free service. Standard aluminum window frames stand up to the elements and the ¼" thick tempered safety glass resists breakage. Shelters are available in 9 standard sizes in three styles or custom configured to your exact specifications. They can be custom color matched to compliment existing surroundings and include optional doors, benches, lighting, climate control, ventilation systems, and more. 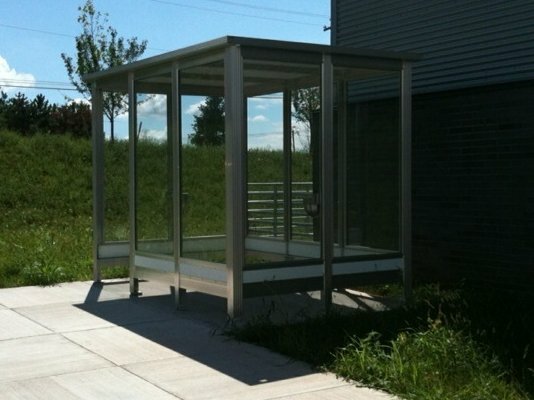 Shelters can be outfitted with many options to enhance functionality and comfort. Cigarette Urns & Ashtrays - Wall mounted ashtrays and urns minimize litter. Exhaust Fans & Ventilation Systems - Important for improving air quality in the shelter. Radiant Heaters - Ceiling mounted heaters with powder coated steel enclosures and push button timers can be added for cold weather areas. Lighting - Popular options include fluorescent fixtures or photocell activated dusk-to-dawn lights, but many are available. Structure - Mill finished, extruded aluminum 6063-T5 ally channels and posts. Welding - All structural components are certified welded at all intersections to create a unitized framework with no rivets, bolts, or fasteners. Wall Panels - Durable and weather resistant ½" Medex™ laminated with gray fiberglass reinforced plastic on both sides. Ceiling - 5/8" white vinyl-faced board with interior clear height of 89". Roof - Units ship with a standard three-inch overhang on the exterior roof. Windows - Anodized aluminum window frames with heavy-duty weather stripped windows made from ¼" thick clear tempered safety glass. Tinted, polycarbonate, and acrylic windows are also available. Electrical - When applicable, all conduit and wiring is surface mounted and installed along with a 100 amp circuit breaker box to power lighting, climate control, and ventilation systems.